IF you’re Irish go find yourself a comfortable armchair, strap yourself in and enjoy the ride as Roddy Doyle might say -- the most important week in the history of our country for a long, long time is almost upon us. It has, I am sure you will be glad to know, nothing whatsoever to do with the presidential election or what Gay Mitchell said about Gay Norris or what Michael D. Higgins had to say about Martin McGuinness. It has nothing to do with house prices, interest rates, exchange rates, the EU, the IMF, the bail-out or the Celtic Tiger. Nothing. In the course of this column, you won’t hear mention of Fianna Fail, Fine Gael, Sinn Fein or Labor for the next thousand words or so. Not a mention at all. And we won’t even pretend we know the meaning of the words recession, depression, double dip inflation or bond holders. For the next few paragraphs and the next few days, you and I and everyone else of an Irish persuasion can forget about all that economic nonsense and concentrate on what really matters in life. Sport. And the pleasure it gives us, pleasure which, for the most part, costs nothing if you so desire. We’ll talk about real sport. International sport. Ireland against the world sport. Man against man. Neighbor against neighbor. Country against country. On Friday night coming, the Republic of Ireland soccer team will, quite literally, go up the side of a mountain and take on as much might as Andorra can find in football terms. On Saturday morning, very early on Irish watches but only just Saturday in New York clock terms, the Ireland rugby team will take on their Celtic cousins from Wales in a field far, far from home. They will meet in New Zealand and in the quarterfinals of the World Cup, just in case you didn’t know it. Then, to round it all off, Giovanni Trapattoni’s team should finally fill the Aviva Stadium next Tuesday night for the first time and for the final European Championship qualifier of the current campaign when Armenia come to Dublin. Three games, five days, a lifetime worth of memories if it all comes good for Messrs Trapattoni and Keane, Kidney and O’Driscoll. There is no reason why it shouldn’t be all right on all three nights for Ireland and the Irish as it happens. No reason at all. Ireland’s soccer heroes will always beat Andorra on paper and should do most of the time on grass, including this Friday. I say most of the time because I was in Liechtenstein in 1995 when Jack Charlton’s team drew 0-0 with the side of a mountain as one journalist famously described it. If Ireland win that one and Slovakia do us a favor and find a new Gary Mackay to score the winner in their game with Russia -- ask your grandfather about the Gary Mackay story if you don’t know it, it’s to do with Euro ’88 -- then a victory against Armenia next Tuesday night will guarantee Trap’s team automatic qualification for the finals. I’m actually going to say that again because I know my regular reader is ready to fall off his chair seeing as how I have been writing this current Ireland team and their tactics off for most of this Euro 2012 journey. Yes, if Slovakia beat Russia on Friday night and Ireland win both their remaining games against Andorra and Armenia, then we are guaranteed to top the Group B table and qualify automatically for Poland the Ukraine next summer. I have to admit it is a mouth watering prospect and one that deserves to be taken seriously, even if we survived by the skin of our teeth in Moscow last time out and barely managed to draw with Slovakia in Dublin in the game before that one. Can the team that Trap has rebuilt and modified do it? Of course they can -- but only if the manager takes some of the shackles off his team. There is nothing to be gained by a cautious approach against Andorra on Friday night. Ireland will score goals, even on a bumpy little pitch on the side of the Pyrenees, against the minnows provided Duffer and McGeady are allowed to get the ball into Robbie and Doyler as early as possible. With those three points in the bag, it will be advisable for Trap to revert to something closer to his regular form at home to the Armenian side that has scored more goals than any other team in this group next Tuesday night, a night when even I will gladly accept a typical one-nil Trapattoni win provided it means we are through to the Euro playoffs at the very least. And what of the rugby boys? They were so good against Italy in Dunedin last Sunday, particularly in the second half, that even George Hook was happy afterwards, albeit at a time when most of Ireland would have been preparing to go to Mass in the old days. The Hookie Monster was proud to be Irish after that second half demolition job on the Italian upstarts who managed just six points for the entire match, all of them before the break in the final game of a pool which Ireland won after many predicted they wouldn’t even get out of. Wales are next up, in Wellington this Saturday, and we don’t yet know whose foot the Wellington boot will be on! Sorry, it was just too obvious. To listen to some Irish pundits, Kidney’s team is now going to win the World Cup. Not a thought many people encouraged after they lost all four warm-up games before heading to New Zealand at the start of September but a thought I have heard more than once this week. Those who know rugby far better than I do, men I do trust and respect like Gerry Thornley and Michael Corcoran from my own profession, reckon it is almost too close to call going into this weekend’s quarterfinal. I am inclined to go with their wisdom on this one. The fact that this is a World Cup quarterfinal with so much on the line means the form book will probably go out the window on Saturday morning and all we can look forward to is a lot of nail biting and tension before the final whistle. Such is the wonder of sport. For what it is worth, I’d be 90-10 in favor of Ireland winning both the soccer matches and 60-40 in favor of our other boys in green on the rugby front. What I do know for definite is that we need both these teams to stand up and be counted this coming weekend. We need Ireland Sports Inc. to give us something positive to celebrate, something to shout about, something to allow us to stand up and tell the world that we’re Irish and proud of it once again. That’s why events in Andorra, Wellington and Dublin are so important between now and next Tuesday night. We may be financially broke as a nation, but we are not emotionally or morally bankrupt just yet. Wins for our footballers and rugby players in the next few days will make the outlook a whole lot brighter for all of us. On all fronts. So go for it lads, go do your country proud. All of you. And good luck. SEAN O’Brien got the Man of the Match award. Cian Healy got gouged but still stood tall. Ronan O’Gara was faultless behind the scrum. Paul O’Connell beat his chest for Ireland for 80 minutes. Keith Earls grabbed two tries on his 24th birthday. 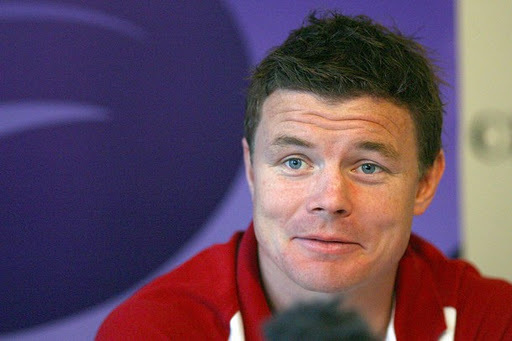 Brian O’Driscoll led by example with the first touchdown of the game. Ireland beat Italy by 36 points to just six in Dunedin last Sunday morning. And they were brilliant, each and every one of them. One more win and they’re into the semifinals of the Rugby World Cup. Two more wins and they’re into the final. Three more wins and … don’t even go there! YOU’LL probably know by now that Carlos Tevez refused to come on as a substitute for Manchester City in the Champions League defeat away to Bayern Munich last week. He’s denied it since but I don’t believe him and I’m glad to say he’s currently serving a two week suspension from all first team activities at City. Sadly, as far as I know, he is on full pay while he serves that suspension and will pick up about $400,000 a week for being a bad boy. The sooner they sack him altogether, the better.